Above photo: I love this shot because it captured just her alone at the piano in the dark. I have wanted to see Roberta Flack in concert since the 70’s when I used to play my brother’s Killing Me Softly album on a regular basis as a kid. When I learned she was doing a benefit concert for the Lyon-Martin Women’s Health Services at the Palace of Fine Arts in San Francisco, I knew I had to be there. The evening began with a pre-concert reception which I had to miss because I was trapped in traffic. I finally got there at 8pm. My seat was in the second row and I got settled in. Roberta’s opening act was a band from Seattle named LeRoy Bell and His Only Friends. It featured LeRoy Bell on lead vocals and guitar, Rick Novito on guitar, Terry Morgan on bass, and Stan White on percussion. The band’s blending of guitars, bass and percussion was wonderful. I would describe their style as folk with a slight edge. LeRoy’s vocals were pleasing without being overly raspy. I would like to hear more of their music. Their latest release is titled Spending Time. There was a short break then my dream came true and Roberta came onstage. The concert was more wonderful than words can convey. She looked radiant, regal and wise as you would expect from a woman who has touched us with her music for so many years. She sounded and played heavenly. She opened with “Oasis” and toward the end she shifted to the rhythms of South Africa and punctuated them with melodic chants. 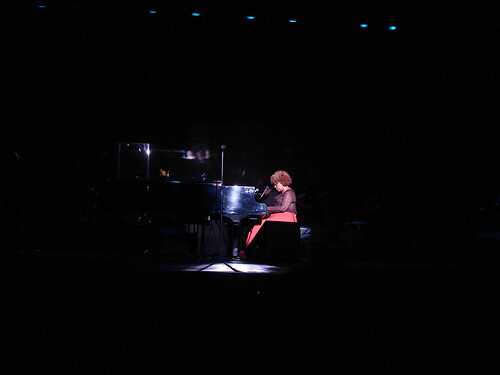 On “Will You Still Love Me Tomorrow”, she playfully paused and encouraged us to sing the hook along with her. She and Tony Terry sang sweetly on “Tonight, I Celebrated My Love.” Roberta gave “Sweet Georgia Brown” a whole new look and feel and her men provided some tight harmonies on the backing vocals. On “Feel Like Making Love”, she sang an extra “feel like” or two as the men sang the hook. The song even shifted into a Marvin Gaye groove as she sang “You Sure Love to Ball” followed by “Mercy, Mercy Me.” The classic “Killing Me Softly With His Song” unfolded into a bossa nova jam at the end. Roberta announced that she will have a new album, R.A.S. – Real Artists Symposium, before the end of the year. She will have 14 songs and it will also showcase the talents of her wonderful band. She is gifted and innovative. You could hear how she inspires her band to greatness throughout the evening. Her first single will be “Say No.” It has a calypso feel as it tells the listener “don’t rush your life” and do not be afraid to say no. Tony Terry sailed into a falsetto stratosphere on his hit “When I’m With You” which will also be included on the album. Jerry Barnes soulfully sang “I’m So High” while Roberta swayed at the piano. Thank you Roberta for killing us softly with your song. This entry was posted on Saturday, October 8th, 2005 at 4:30 am. It is filed under Concert Reviews and tagged with LeRoy Bell, Lyon-Martin Women's Health Services, Palace of Fine Arts, Real Artists Symposium, Roberta Flack. You can follow any responses to this entry through the RSS 2.0 feed. sounds like that was an incredible concert. You know you’re killing me right? Killing me dead. Awesome! She remains one of the very best around. She can tell the story and it goes straight to my heart. Thanks for your photo and account of that night. I was there too and am a fan till then end.